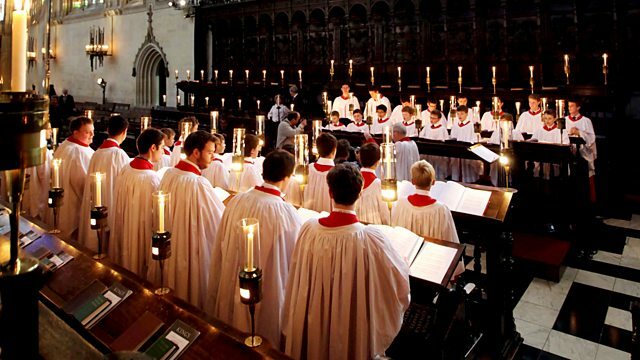 From the candlelit chapel of King's College, Cambridge, and based around nine Bible readings interspersed with Christmas hymns and carols sung by the world-famous chapel choir. A message from the Dean, and Director of Music of King's College, Cambridge. The sound of a solo boy treble singing ‘Once in Royal David’s City’ in a chapel packed with people who have queued half a winter’s day to be there, transmitted by Radio to millions across the globe, has become the true start of Christmas for many. The precision of the timing, 3.02pm GMT, coupled with the global sweep of the broadcast, bring time and space together, and seem to shrink the business of the world to the scale of a college chapel. It has not always been thus. The Festival of Nine Lessons and Carols may feel as if it has always been there, but it was first celebrated in 1918. Broadcasting by Radio followed in 1928 and it was first televised sixty years ago in 1954. Today the Radio Broadcast is a live transmission direct from the Chapel, whereas what is offered to a Television audience has been pre-recorded. One of the most wonderful aspects of the Festival for those who are present in the chapel, is the way in which the vast windows become dark during the afternoon so that by the end the candles around the choir suggest a remarkably cradle-like shape when the Provost reads the final lesson – ‘and the word became flesh’. The fact that the first service took place soon after the end of the First World War is no accident. Rather it is the key to understanding the spiritual depths of the occasion. The service was the brainchild of Eric Milner-White, who had been the College Chaplain before the war and then went to serve as an army chaplain. He was decorated, but also traumatised. When he returned to King’s as Dean in 1918 his experience told him that if religion were to connect with people’s lives it would have to be different. Milner-White was no radical, however, and found his idea for a new service in something that had already been tried. By bringing it to King’s, and offering it as a gift to the city, he transformed the service devised by Bishop Benson for Truro, a transformation which has continued both as he tweaked it into its now familiar shape during his tenure as Dean, and as it has developed musically through the work of successive Directors of Music. The greater part of the musical content is traditional in character, carols and hymns being selected to reflect the themes of the readings, in the same way that the responsories in the monastic office were linked to the preceding passages of scripture. Some of the choices mark anniversaries of significant composers. In 2013 Benjamin Britten featured strongly in his centenary year. This year, music by two of our senior composers who are celebrating their 80th birthday - Harrison Birtwistle and Peter Maxwell Davies - together with a piece by William Mathias, who would have been 80 this year, is included. The distinguished musical contribution of Sir David Willcocks, who celebrates his 95th birthday at the end of this year, is an enduring one. Annually since 1983 there has been a newly commissioned carol, reflecting the need to renew our great tradition regularly with fresh material. This year's new carol is by the Swiss composer, Carl Rütti. After the famous opening carol, the service is introduced by a Bidding Prayer written by Milner-White himself in those difficult days when memories of the trenches, and the huge sense of grief at the loss of so many young lives, would have been acute, if not utterly overwhelming. His words have been read by many ministers around the world, but few properly appreciate what was on his mind as he wrote and read this paragraph. "Lastly let us remember before God all those who rejoice with us, but upon another shore and in a greater light, that multitude which no man can number, whose hope was in the Word made flesh, and with whom, in this Lord Jesus, we for evermore are one." Once the context is known this reads very differently – ‘another shore’ is not just a metaphor for heaven, but a reminder of recent atrocities overseas. And ‘that multitude which no man can number’ would call to mind not merely a vague sense that ‘well yes, many people have lived before us’ but the long, long lists of names that were then being collated and would in time be etched on to war memorials. Memorials such as the one in a side chapel at King’s which Milner-White was responsible for, and which should, perhaps be one of the images in our minds when we think of King’s College, Cambridge at Christmas. Stephen Cherry, Dean, and Stephen Cleobury, Director of Music, King’s College, Cambridge.